• LEGO® Architecture interpretation of the real-world architectural landmark, the Arc de Triomphe. • Features statue-adorned pillars, sculptural reliefs and subtle coloring that adds warmth and emphasis to the model’s bold lines, curves and contours. 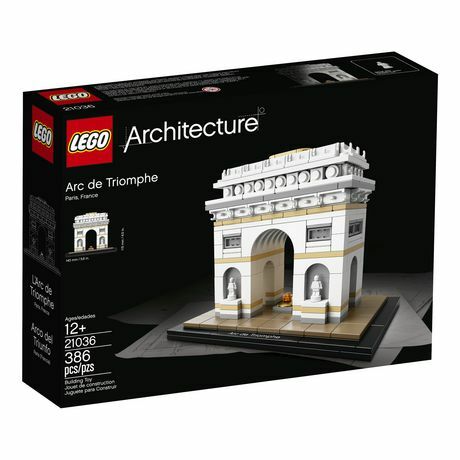 Also includes a golden plate to represent the Tomb of the Unknown Soldier and a buildable LEGO® interpretation of the eternal flame. 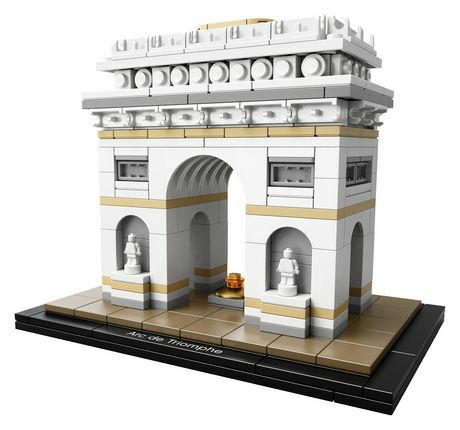 • Includes a decorative “Arc de Triomphe” nameplate. • The included booklet contains information about the design, architecture and history of the monument (French and English languages only. Other languages available for download at LEGO.com/architecture/booklet). • Delivers a pleasantly challenging and rewarding building experience. • Measures over 4” (11cm) high, 5” (14cm) wide and 3” (9cm) deep.